Moderators: Taizo Nakano, M.D. ; Ann Kulungowski, M.D. Guest Speakers: Denise Adams, M.D., and Ilona Frieden, M.D. Taizo Nakano, M.D., and Annie Kulungowski, M.D., moderated a broad-ranging discussion of management issues associated with cystic lymphatic malformations. The patient cases presented ranged from simple to complex. Drs. Nakano and Kulungowski were joined by Denise Adams, M.D., Co-Director, Vascular Anomalies Center, Boston Children's Hospital; and Ilona Frieden, M.D., Director of Pediatric Dermatology, UCSF Benioff Children's Hospital, who discussed various diagnostic issues, treatment strategies, and their effectiveness. 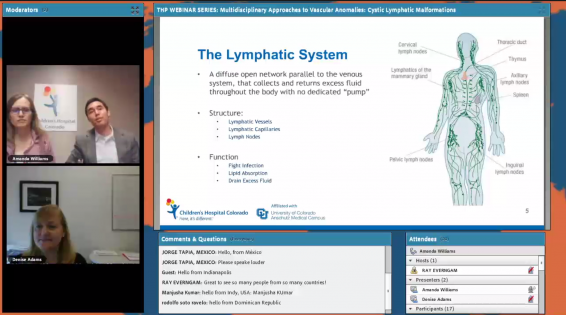 The live webinar allowed interactive exchanges between participants and the expert panelists as they addressed fundamentals of basic techniques and strategies in treating venous malformations. A global virtual audience interacted live via chat, encouraging discussion and debate. Polls helped guide attendees through to understanding important takeaways on diagnoses and various treatment options. This THP Webinar was presented on 25 April 2018.